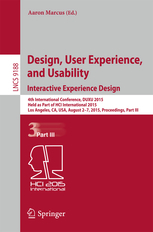 I recently came across a very recently published book chapter called ‘Design, User Experience and Usability: Interactive Experience Design” that includes a series of papers that address the latest research in design and use of computing systems. The book is organised in several chapters ranging from designing for the Web experience, to mobile applications and information and knowledge design and visualisation. ‘Designing the Driving Experience’ is a chapter in the book that itself is formed by a collection of a number of papers outlining current research in the area of designing the driving experience- ranging from automation, to studies on the usability and user experience of in-car technologies. Drivers and Automation: A study About Cultural and Behavioral Influence in the Interaction with Driver Assistants (Rafael Cirino Goncalez and Manuela Quaresma). Going on a Road-trip with my electric car: Acceptance Criteria for long-distance-use of Electric vehicles. (Julian Halbey, Sylvia Kowaleski, Martina Ziefle). A study on a split view navigation system (Jongsung Lee, Heewon Lee, Sung Woo Kim). What travelers want: An investiagtion into user needs and user wants on display (Tingyi S. Lin and Chia-Nien Chang). Head up display in automotive: A new reality for the Driver (Annie Pauzie). What are the expectation of users of an adaptive recommendation service which aims to reduce driver distraction? (Nadine Walter, Benjamin Kaplan, Carmen Wetterman, Tobias Altmuller and Klaus Bengler).